Telecoms giant BT is in exclusive talks to buy EE - Britain's largest mobile network group - for £12.5bn. It said the period of exclusivity would last "several weeks" to enable it to carry out the necessary negotiations. In late November, BT said it was in talks to buy either EE or O2, which is owned by Spanish firm Telefonica. "The proposed acquisition would enable BT to accelerate its existing mobility strategy," BT said in a statement. Under the terms of the proposed deal, EE's owners Germany's Deutsche Telekom and France's Orange would take a 12% and 4% stake in BT respectively. 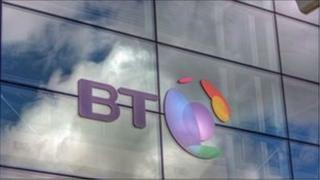 Deutsche Telekom would also be entitled to appoint one member to the board, BT said. A takeover of EE would create a communications giant covering fixed-line phones, broadband, mobile and TV. Vodafone, Sky, Virgin, Talk Talk and 3 - the other major players in this market - will all be watching developments closely. One of the biggest worries, I am told, is over what is known as "backhaul" services. That's the vital bit of the telecoms infrastructure that links mobile transmission masts with the mobile operator's network. It's run by BT Wholesale. Now, if there is a deal, that could raise concerns as BT would then be running its own mobile business through the "piping" that is also owns. EE leads the market in 4G (the fastest mobile bandwidth), has 24.5 million customers, and holds 33.8% of the UK mobile market by revenue, according to Citigroup. BT said owning EE would accelerate its plan of giving customers seamless access to the Internet whether via fibre broadband, wi-fi hotspots or 4G mobile services. BT said it also expected "significant synergies" through the deal, with savings on IT and back office costs as well as marketing and sales expenses. It said it would also be able to sell its fixed line services to EE customers who did not yet take a service from BT. EE's owners put plans for an initial public offering of EE on hold this year. BT spun off its own mobile network, BT Cellnet, now O2, in 2002. In 2005 it was acquired by Spain's Telefonica for £17.7bn. Despite the talks, BT said it would continue with its own plans for providing mobile services to businesses and consumers, and said it "remains confident" of delivering on its plans if the deal with EE falls through. Paolo Pescatore, a communications analyst at CCS Insight, warned the deal would face scrutiny from telecoms regulator Ofcom. "It combines the UK market-leader in fixed-line with the number one mobile operator. We believe it is unlikely that Ofcom would block the deal, but the combined entity could be forced to dispose of some spectrum [assets]."